Roasting eggplant (or aubergine) is my favorite way to prepare it. The more I travel the more I find new ways to cook this versatile fruit. Find my recipes for Sausage Stuffed Eggplant from Italy and Turkish Eggplant with Onions and Fresh Herb on this site for example. 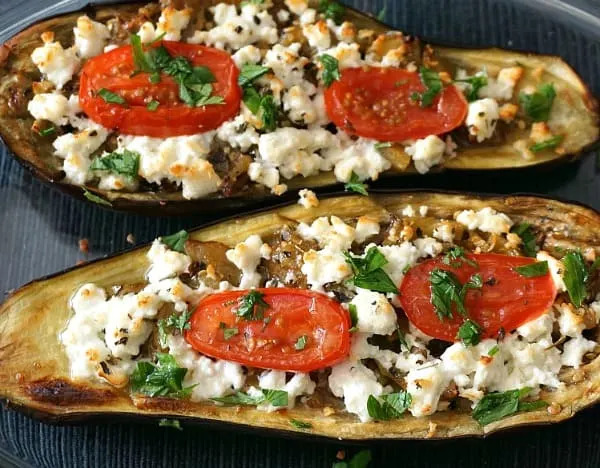 This recipe, Roasted Eggplant with Tomato and Feta, was inspired by my time in Bulgaria. Bulgarian’s love their cheese! When cheese is added to a recipe in Bulgaria it’s piled on high. Bulgarian’s favorite salad, Shopska is made with chopped peppers, tomatoes, cucumbers and onions and cheese. When it actually comes to the table it’s difficult to see the vegetables underneath the pile of cheese grated on top. The same is true when ordering the Roasted Eggplant. The cheese of choice for this dish is Bulgarian white cheese or sirene. It is very similar to traditional Greek feta cheese but is a little more dense. I’ve substituted sirene’s Mediterranean cousin, feta cheese, in this version of the recipe. It is easier to find and the results are equally delicious. The addition of red wine vinegar at the end brings all of the flavors together. 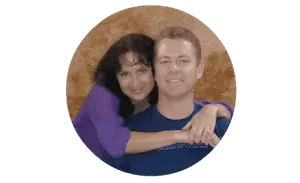 Try it first without it and see what you think! I’ll bet I won’t be the only one who likes it better that way. The eggplant can also be scooped out and spread with the cheese on toast. Visit our food finds/recipes section to view our entire collection of recipes inspired by our travels around the world. 1 Roma Tomato or Several Cherry Tomatoes. Cut the eggplant in half and score the flesh with a sharp knife. Remove the flesh, leaving enough to hold the skin together and using care not to pierce the skin. Coat the interior with olive oil and season lightly with salt. Place the eggplant hollow side down in a baking dish. Bake for 10 minutes in a 375 degree oven, until the skin begins to soften. In the mean time, cube the flesh of the eggplant. Add the olive oil and garlic to a pan over medium heat and saute until it begins to brown. Add the eggplant, splash of white wine, oregano and chili flakes..
Cook until the eggplant softens (but does not become mushy). Removed the eggplant skins from the oven and stuff with the eggplant mixture. Return to the oven and cook for another 10 - 15 minutes. When the eggplant skin softens remove it from the oven. Top with the cheese and tomato and sprinkle with oregano. Broil until the cheese begins to brown. Sprinkle with parsley and serve with red wine vinegar. You have beautiful pictures to go along with with a great sounding recipe! I love eggplant! What a beautiful dish. 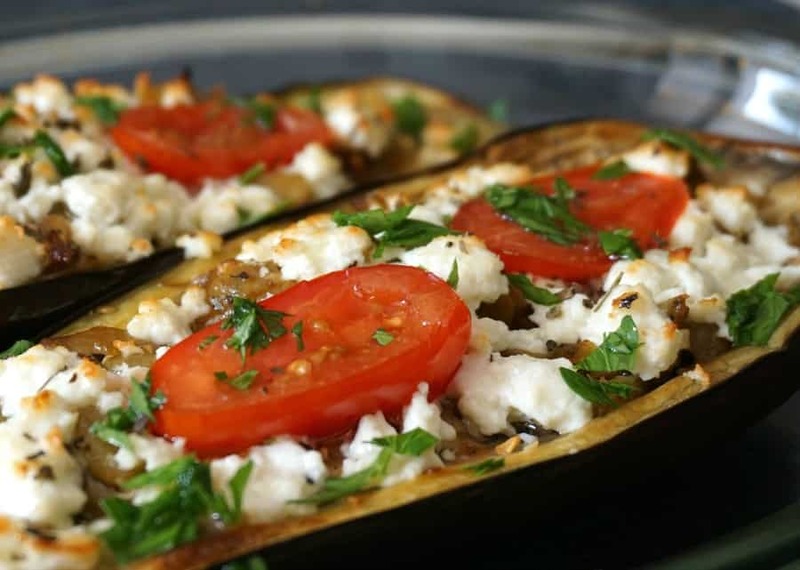 I love eggplant and you have paired it with delicious flavors. Yum! I had roasted/stuffed eggplant years ago at a restaurant and loved it. This sounds like an even better version! Saving to try soon! This is a beautiful dish – and I think it would be delicious with roast chicken or pork! What a delicious veggie packed meal! It looks so colourful, and anything with feta is good with me! Tastes as good as it looks. 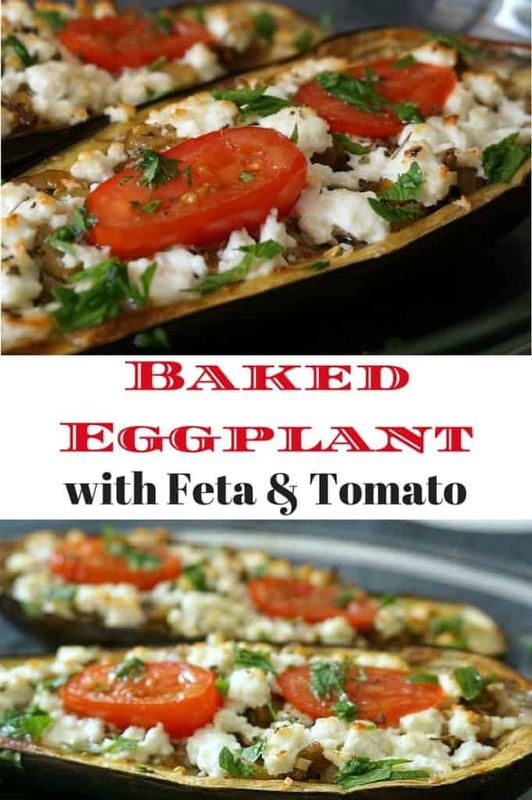 You can not go wrong with fresh eggplant, tomatoes, and Feta. Having tried many types of Feta, both imported and domestic, my favorite is imported from Greece. The combination of sheep and goats milk used in Dodoni Feta is the best I’ve had outside of Greece. Really must try this – looks great and seems easy enough!